Download the e-publication from the Van Abbemuseum website. Catalogue : With texts by : Charles Esche, Bernard de Montferrand, Diana Franssen, Ami Barak, Aliocha Imhoff & Kantuta Quirós / le peuple qui manque, Stephen Wright and an interview with the directors of the FRAC. Can we begin to map recent cultural history? What do contemporary artists and their works have to say about their own time and place. How do we combine the story of a nation with globalisation? 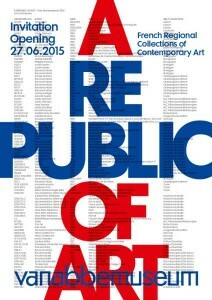 A Republic of Art is an exhibition about the world of visual culture in the French republic from the establishment of the FRAC system (Regional collections of contemporary art) in 1982 right up to current developments in contemporary art practice today. This large scale exhibition draws works from these extraordinary and extensive art collections over the past 30 years. The Van Abbemuseum was invited by PLATFORM to reflect on this collection that is embedded in French cultural and political history. The Van Abbemuseum was chosen because of the many experiments it has conducted with new ways of exhibiting and interpreting its own collection during recent years. A Republic of Art is a stimulating tour of the contemporary art which has been collected by the French government since 1982. In their works of art the artists reflect on the world around them, so that visitors are taken along through history, undoubtedly evoking personal memories. the FRAC philosophy the only point of purchasing works of art is that they become accessible on a large scale. For this reason they organised big educational programmes and produce more than five hundred exhibitions a year, particularly in places that were not originally intended for art. The exhibition will be accompanied by an e-publication with texts by Ami Barak, Aliocha Imhoff & Kantuta Quiros, Stephen Wright and Diana Franssen and interviews with Catherine Elkar (director of FRAC Bretagne), Xavier Franceschi (director of FRAC Île-de-France) and Laurence Gateau (director of FRAC des Pays de la Loire). Introduction by Charles Esche. 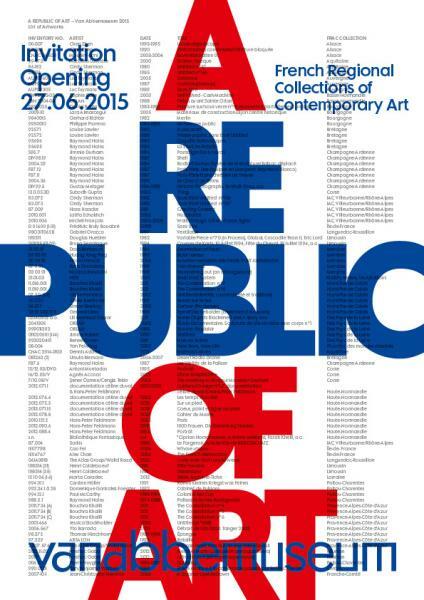 A Republic of Art is organised in collaboration with PLATFORM, the umbrella organisation of the 23 FRACs in France. FRAC advisory board: Catherine Elkar (director FRAC Bretagne), Xavier Franceschi (director FRAC Île de France), Laurence Gateau (director FRAC Des Pays de la Loire), Anne-Claire Duprat (PLATFORM). Subsidisers: ministère de la Culture et de la Communication, Institut français, the French Embassy in the Netherlands, VSB Fonds, & Fondation Hippocrène.